AMBER LOVE 26-JUNE-2017 My work is supported by the generous backers who tolerate my cat stories at Patreon.com/amberunmasked and they also get first access to what’s happening with my books and podcast. 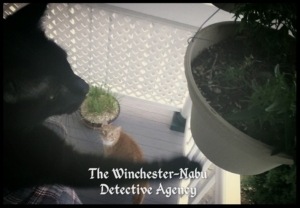 Detective Inspector Guster Nabu and Professor Oliver Winchester have been collecting insect specimens and closely observing the finch nest. NOT CHINATOWN. SUMMER SOLSTICE. EXTERIOR. 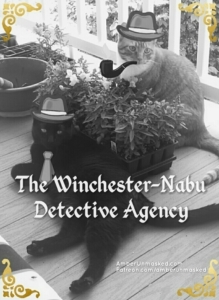 WINCHESTER-NABU ESTATE. 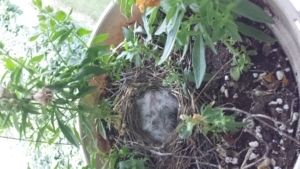 Both cat detectives were given the opportunity to peek into the snapdragon basket to observe the newly hatched baby finches. Oliver was of course, the perfect gentleman. Gus, however, likes to take a hands-on approach to examine things. Though he did catch a claw or two on the basket and make it swing, he didn’t get any of the birds. The finches are fine and that means it was time for a new case. After a failed attempt to join in the celebration of the International Day of Yoga which is also on the summer solstice this year, Gus worked on his parkour in the studio where a mattress and boxspring are being temporarily stored. Oliver has tried to convince Gus to study bartitsu, but they always seem to end up grappling. It was time for another exploration through the grounds of the estate. The new case indicated that something needed to be returned. Based on the analyzed data of the Super Smeller™, there seemed to be a snake on the loose. It was unclear why on earth their client, the Grumpy Old Man, would want it returned. It was unusual for Gus to take his time. We walked at a snail’s pace for quite a while. He had to smell every piece of wood, every blade grass. He gnawed here and there to make sure his own calling card was left behind. There was a strong hint of activity in the small shrubbery around the motorized vehicles. Those shrubs were where we observed a local calico catch an ROUS (rodent of unusual size). Perhaps the Grumpy Old Man was after rodents instead. 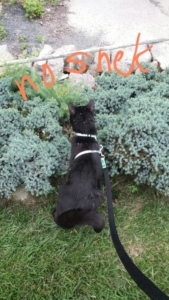 Guster explored farther and farther into the bushes. He came out a complete mess and without anything to show for his effort. He lead the way to the exterior of the north wing where Oliver’s residence and study are located. Outside there’s a sunken patio covered in irregular slabs of slate. There are two sets of enormous French doors and two small staircases. Across from those sit the fountain. In the center is furniture occasionally used by the humans, but still in need of examination since a snake was spotted in the vicinity not too long ago. No signs today though. The fountain no one seems to ever use. We crossed through the grove and headed towards the fairy garden. That’s when something caught our attention. I looked down and saw a strap of black at my feet and it was quite large. Yet, the detective who was much closer to it, showed no interest at all. 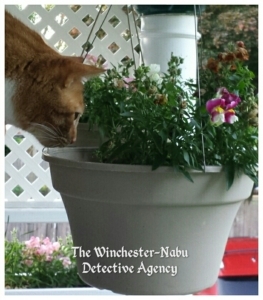 He wasn’t detecting any smell or visual cue of a snake. I bent over and grabbed it in my hand. It was rubbery and had two curved hooks on the end. A bungee cord. Maybe, it was a fake snake that the Grumpy Old Man wanted returned. We still weren’t sure and kept tracking scents. We circled around the abandoned war fort and paused to check on all the trees at the back of the fairy garden. The ruins of a shed didn’t hold any interest this time either. 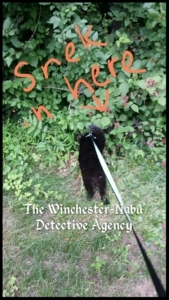 Gus took a brief look at the center courtyard’s lilac bush — nothing there at that moment, but it wasn’t abandoned completely. It was time to explore the Grumpy Old Man’s personal lair and secret trails. I left the bungee cord for him at his door while Gus kept pulling for me to go around to the landfill of junk (called “parts”). I wouldn’t let him go even though bunnies are likely to be there. Fortunately, Gus caved to my suggestion of checking out the trail through Bunny Hollow this time. As we went along, it got more narrow and the swarms of bugs grew to an intolerable level. That’s when he saw it! Gus pounced onto something moving. It was curling and slithering in a way that meant his tactics used on mice were not going to work. He chased it into the bushes. I wouldn’t let him go any deeper. It was a simple garter snake about 10-12 inches long. He tried to pull on his leash, but that was enough excitement for me. Against his wishes, I picked him up and walked back home. I thought he’d be tired out, but he was so wound up with excitement, he trained with his toys to improve on his attack moves. 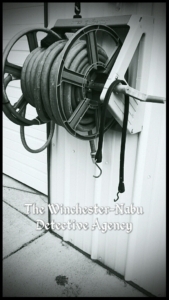 Waiting to hear from the client if the bungee cord was what he wanted.